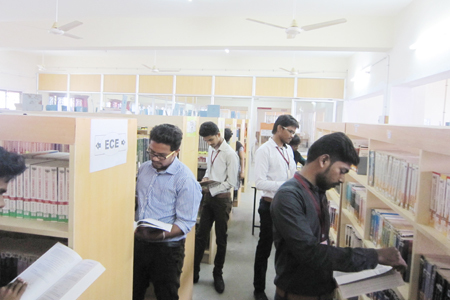 Our Library is located on the second floor of the EEE building with adequate space and good ambience with plinth area of 913Sqm. 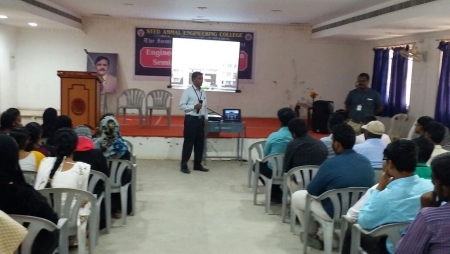 Week days (Mon- Sat) - 8.00 a.m. to 7.00 p.m.
Sunday - 9.00 a.m. to 1.00 p.m.
All the students, faculty members and staff members of Syed Ammal Engineering College can simultaneously access the above databases (except DELNET) since it is IP based access and no need of username and password. The availability of books in the library can be checked by using Online Public Access Catalogue (OPAC). 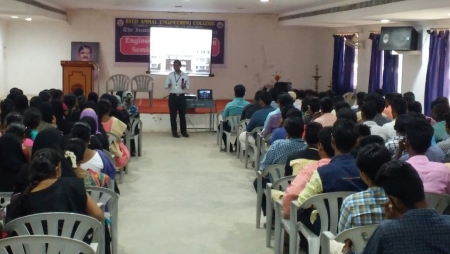 The books are arranged in the certain subject order such as ECE,EEE, CIVIL, Mechanical, Computer etc. The books available in the stock section will be lent. To access OPAC facility, Login to our website www.syedengg.ac.inand click the option of student web portal. One must register themselves before using web portal. Through the OPAC facility one reserve the books required for them. Faculty Members - 6 Books for 180 Days. Lab. Technicians - 1 Book for 30 Days. Students (UG & PG) - 6 Books for 15 days and they can be renewed once. One additional token is issued to the semester wise rank holders of each department. The rank holders list will be updated semester wise. The number of books mentioned against their category can be borrowed at a time for a mentioned period against each category. Renewal of the borrowed book is permitted until no user has reserved it. Provisions for reservation of issued books are permitted. During each transaction, ID card should be produced in the issue/return counter. While getting the book issued, please check the book whether it is in good condition. If not, bring it to the notice of the librarian otherwise you will be responsible for the damage and liable to replace the book. 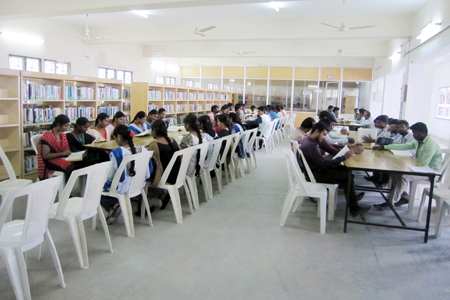 A digital library is equipped with 20 number of state-of-the-art computers, CDs and DVDs which enable the users to utilize the wide variety of digital collections. 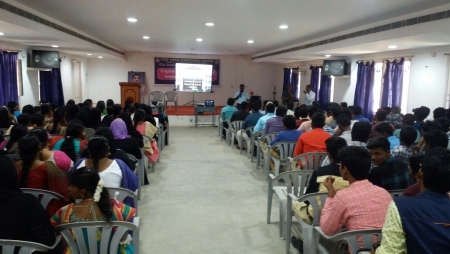 Facilities are provided to watch the contents of NPTEL courses. 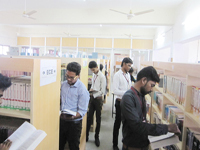 A reference section is equipped with many number of encyclopedias, dictionaries and valuable books on various subjects for the immediate reference. Books available in this section will not be issued and permitted to take photocopy within a library premises. 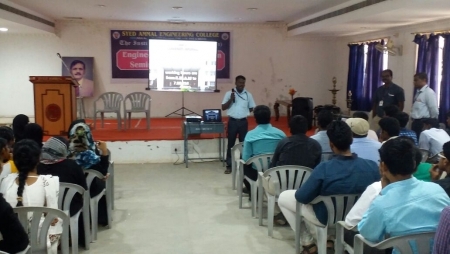 Syed Ammal Engineering College subscribes to 70 number of periodicals related to Engineering, Management, science and. The back issues of the journals are bound and maintained as back volumes. The issues of the periodical and back volumes will not be lent and permitted to take photocopy within the Library premises. Reprographic facility is available inside the library to enable the users to take photo copies of the books, magazines and journals etc. at nominal cost. A separate section is devoted for keeping the project report of the final year students. This helps the students to get some thoughtful ideas about their final year projects. Students should keep their personal belongings in this section and they should not carry it to the library. The Library will not accept responsibility for the loss or misplacement of personal belongings. Use the identity cards while entering the Library and without ID card one should not enter or leave the Library. No one is allowed to take the personal / issued books inside the Library. Leave all your belongings in the cloak room. Books will be issued / returned using Identity card. Books barrowed must be returned on are before the due date. Users are requested to verify the physical condition of the books before barrowing. For late return of books, overdue charges will be collected as Rs. 1 per day. Users are requested to maintain silence inside the Library. Get yourself checked at the exits point when you go out of the Library. A Book once taken out of the shelf must be left lying on the nearby tables and Library staff will rearrange the book at the appropriate shelf. If you dont find what your actually require, the library staff will be pleased to help you, if your approach them. Users are required to switch off the lights and fans when not required or while leaving the reading halls. The Library staff has the right to request a user to leave the permise, if the the user violates the rules. The chief Librarian may amend the Library rules and regulations as and when necessary. 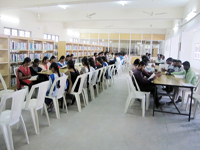 Users are requested to keep the Library and the campus neat and tidy.